The reason for doing a land-use plan is to give a community options, in light of their spatial circumstances. The essential tool for doing a land-use plan is listening… to the land, to the people, to the way those people make a living from that land. A careful observation of their natural, cultural, and spiritual context is the deliberate step a community can take into its own future. Our job is to help you listen, help you create, and help you implement your plan. These may be purchased as single services, but may also be part of a larger comprehensive planning exercise. If you are already into your own community planning exercise, we can assist by acting as independent facilitators of the process. As a neutral third party, we may also help you work through contentious land issues while remaining objective. We conduct a variety of workshops and training seminars that raise awareness and provide guidance and advice about the planning process. Workshops may be held with a single community, or a group such as land managers association, or tribal council. We Provide documentation, mapping and administrative procedures as needed. It was a cold, blustery day in February 2004 when Janet Amos and I made the ferry ride on an ice breaker to Christian Island in Georgian Bay, the home of Beausoleil First Nation (BFN). Our first trip to this island community was to begin planning for a workshop with local OPPI members and the First Nation. Our goal was to identify important planning-related topics for the community. 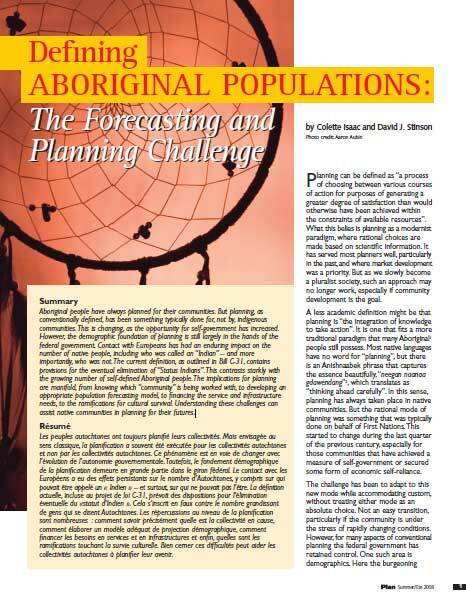 This scholarly article discusses the technique and evaluation of aboriginal populations. It was published in the Summer 2008 issue of PLAN. The concept of resilience has been used in developmental psychology and psychiatry to describe individuals’ capacities to achieve well-being and thrive despite significant adversity. Resilience is also a useful concept in ecology where it draws attention to the ability of ecosystems to adapt to environmental stress through transformation. Incite develops powerful educational presentations for our clients and for educational purposes. Review previous Powerpoint presentations here.